Create beautifully bespoke and unique gifts by adding an image, or logo onto your chosen bottle. 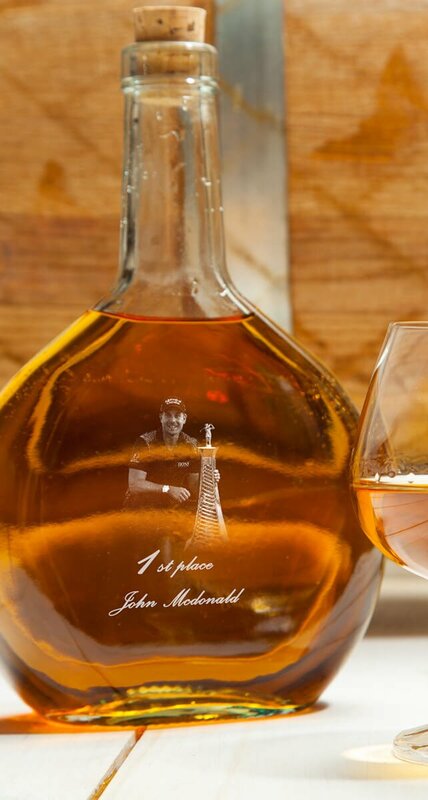 Photo engraving creates a perfect opportunity to capture a special memory, to recreate a funny moment, or present your brand Icon or logo onto a bottle of your choice. You must own the rights to be able to recreate the image legally. Professional photographs such as those taken at a wedding or baby photo shoots are generally copyright material and you will need to seek permission from the person or company who has taken the images for any reproduction. Just like images, any logos, crests, badges, and artwork may have a copyright and be registered as trademarks. The majority of professional and some amateur club-crests will be covered by copyright which cannot be recreated without a licence. Only send images, logos, and artwork that you own the rights to. The final image engraving quality and detail that can be seen is largely dependent on the original photo quality. Please make sure you send the largest possible resolution image to maximise the engraving quality. Avoid sending images that contain large areas of light or dark, where the photo has poor contrast, or where the image is blurry or has a low amount of detail. Our dedicated technician will advise if the image is suitable and may ask for other images to achieve a better- engraved outcome. Please note the image may be cropped, and backgrounds may be removed to get the best possible outcome for the image. If you have any specific details from the background or from the photograph that you would like to keep, please notify Engrave Drinks in advance or as your order is placed. We reserve the right to refuse engraving of explicit or offensive messages.